A rich, sumptuous soap with fresh pureed Avocado pears that give a moisturising, rich and creamy lather. Avocados are highly nutritious, containing potassium, calcium, fibre, riboflavin, polyunsaturated fatty acids and Vitamins C, E and B6. 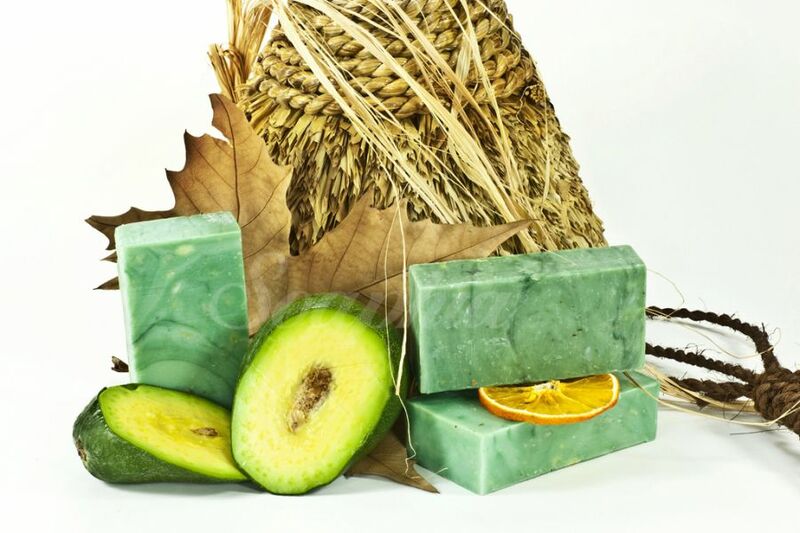 We also use Avocado pear oil to superfat this soap. This oil contains vitamins, plant proteins, lecithin and fatty acids that are excellent and nourishing for dry and dehydrated skin. It is regenerating and restructuring and known for its healing, anti-bacterial and anti-wrinkle properties. It stimulates collagen in the dermis, helping to erase visible signs of ageing and softening the skin. It has a high Vitamin E content, a powerful antioxidant that absorbs free radicals. This bar is a delicious delight with a clever synergy of essential oils that give a special, natural delicate fragrance of orchard fruits with a touch of spicy Ginger. Although this soap is so good for parched skin types, it is also light and astringent enough to assist congested, problem skin types, even acne prone skin can benefit from regular usage of this lovely bar. kullanışlı ve faydalı bir ürün oldugunu düşünüyorum..